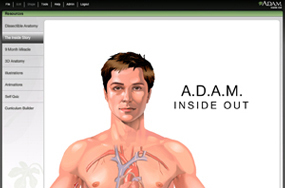 The most comprehensive interactive anatomy teaching tool available online. A.D.A.M. Inside Out brings the human body to life for teaching K-12 anatomy and physiology. 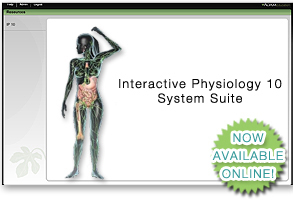 Bring physiology to life with Interactive Physiology 10. Our innovative, award-winning interactive educational tools help you enhance your students' abilities to learn about life and the human body. "We have been using A.D.A.M. Interactive Anatomy at HCC for several years as an alternative to wet-lab dissections and the students love the program. The recent upgrade to A.D.A.M. Interactive Anatomy has taken our labs to the next level. We have customized our laboratory handouts with screenshots from A.D.A.M. Interactive Anatomy which students use in preparation for their practical exams. Being able to customize A.D.A.M. Interactive Anatomy to meet our needs is wonderful. The option for students to use the pin on/pin off function is always well received and helps us, as instructors, create tailored quizzes for them to monitor their learning progress. The students frequently comment on how much they like the 3D models, especially since they can access them, and everything else, from home. I enjoy the clinical images included in A.D.A.M. Interactive Anatomy, as I can integrate them nicely into my classroom presentations. I would recommend A.D.A.M. 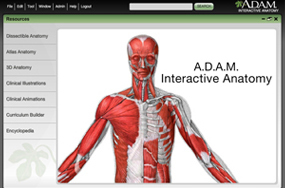 Interactive Anatomy for any instructor looking for ways to help bring their lectures and laboratories to life."